Carlos Rodríguez Braun is Professor of History of Economic Thought at Madrid Complutense University. 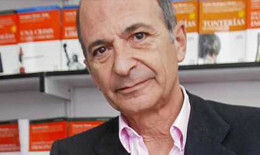 As a writer and editor he has published several economic studies and translated the work of many prominent economists into Spanish. Furthermore, he has written some four thousand articles in the Spanish, European and American press. He is currently a columnist in Spain’s leading economic newspaper, Expansión, and broadcasts on Spanish radio. Born in Buenos Aires, he is a member of the American Economic Association and the Mont Pelerin Society.